To view all of our courses, visit the course catalog page. Finding good people to work on projects is both about project and process management. Cheetah Learning is in a growth phase and I’ve been reaching out to a variety of the freelancer sites (like Freelancer, Upwork, and Fiverr) looking for talent on short demo projects. I’ve also been doing fix-up projects on a couple of properties and have turned to Craigslist, Care.com and Home Depot’s Pro Referral app. I’ve used UHaul’s Moving Help app as well, to help with moving projects. I’ve had great results with them from Anchorage to Arizona. Other than the Moving Helpers app through Uhaul, I’ve had less than great results with my other projects. It got me thinking – was it them or is it me? In the Moving Help app tied into Uhaul, the process is very well defined. I am moving, I need people to help me pack, load up the truck, unload the truck and I need it done at a very specific time. They know this process as they help people do it day in and day out all over the US. But for me, I don’t move that often so it’s a project. They help me do my project with their very well defined process. This industry is used to very short-term gigs. There are well-defined expectations on both sides of the fence. You put in the locations for your move and the dates. You get a list of potential moving helpers who are available and their rates. Once you’ve made your selection, they take your payment and hold it in escrow until you specify the job is done. Once the moving help is complete to your satisfaction, you specify the job is done. Then the moving help gets a code and gets paid. Many of the challenges faced in hiring temporary help have been worked out using their service. I now use this exclusively for moving and it’s made that part of life significantly easier. For the others, I may have thought I did a good enough job defining the project – but did I really? In many of the demo projects, the freelancers and the job sites wanted to push me quickly to more permanent engagements but I was still just getting to see what these folks could do and I wasn’t all that impressed. In most cases, I was not impressed enough to make that leap from using a freelancer once or twice to bringing them into our well-established team full time. Part of it was my problem with the way I was managing the projects. After all, I was the project sponsor and the project manager in all these instances. In one home repair project to fix a front porch – I should have used Freelancers Escrow.com application that manages payments based on the contractor meeting specific milestones. (But I only learned about that shortly AFTER I finished that project). As it was, the contractor I hired stretched out a simple one week project to four weeks (it was during the World Cup Soccer Matches and watching those games took priority over my job). That project ended up costing me twice as much and taking four times as long as was originally bid. Needless to say, I won’t be hiring that contractor again or managing that type of project without using Escrow.com. But isn’t this the case with any qualified professional – that they have a well-defined process for their work and guide you in how it’s done? It certainly is for the folks who come to Cheetah Learning to become Certified Project Managers – after almost two decades in this field, we know what it takes to help someone become a better project manager. I can’t imagine someone hiring us and me saying – “well let’s see how it goes” or them saying, “well we don’t have much experience in training project managers, but we think it might be better if you do it this way.” I darn well better know how it’s going to go if they are hiring me to help their folks become better at project management. And I better have the savoir-faire to help them see that our 20 years of doing this might have given us some insights into how to best do this particular job. Do a darn good job of scoping out your project from the get-go. I do this using a simple project plan I created as part of Cheetah Project Management. I do this ALONE – in the first pass through to make sure I know what it is I’m looking for – no matter how small or large the project. You can get your free copy of this by watching our free hour-long webinar Finish Projects Faster – 3 Crucial Steps. Get the professionals you are considering hiring to define their process for the work for which you are hiring them to do. If they are true professionals, they will have their process well defined and will tell you how they work to deliver you great results. To ferret out the “slick willies” from the true experts, look at their other projects and the results they have had. Match their process with your project requirements to see if there is a fit – BEFORE you retain them to work on your project. Use a service like escrow.com to make sure you have agreed on what it will take for them to get paid based on meeting specific milestones. Do not get pressured into hiring anyone into a full-time position until you are sure they fit. Take it slow, one project at a time and test out a range of projects to evaluate their skills BEFORE making further commitments. Don't make preparing for the PMP exam a full-time job. PMP, Project Manager – Jade Kat Project Management Inc.
PMP, CEO - Clickguide Inc.
" "PMP", "CAPM" and the PMP and CAPM logos are certification marks of the Project Management Institute which are registered in the United States and other nations. The PMBOK® Guide - 6th Edition is a registered trademark of the Project Management Institute. 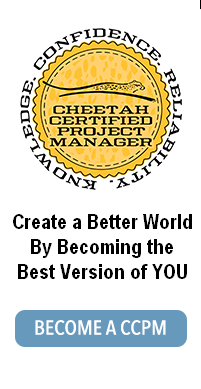 CHEETAH LEARNING® provides both CAPM and PMP Exam preparation and continuing education for Project Managers." © Copyright 2018 Cheetah Learning.